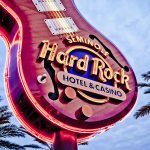 Playing at the Seminole Hard Rock Hotel & Casino Tampa (SHRT) is both adventurous and entertaining, but with 120 table games, proper etiquette can get lost in the shuffle. Not to worry though, we are here to provide you with a quick list of do’s and don’ts when playing at SHRT. Before sitting at a table, be sure to look at the minimum/ maximum bet. If you are joining a table, be sure to ask the group if they mind you joining that hand. Otherwise, it’s suggested you wait patiently until the hand is through. Do not assume a seat is open if there is no one present. In some games (Blackjack and Pai Gow), guests can play up to three spots on the table. Tipping the Dealer is not mandatory, but it is proper etiquette to do so, especially when winning. There are two easy ways to tip the dealer: place the dealers “tip” in front of your bet, which is considered playing with the dealer OR wait until the hand is complete to provide the tip. Avoid foul and offensive language when communicating with both the Dealers and Players. If approaching a non-smoking area, do not smoke behind or nearby the table/ room. Avoid screaming when winning and/or losing, as it is a distraction to other Players nearby. When leaving a table, notify the Players so they can adjust their bet accordingly.